Although Chester resident Pam Fox is 75 years old and confined to a wheelchair as she suffers from MS, she loves to go on day trips and visit new places. Pam is now able to get out and about with the help of her Home Instead caregiver Johnny Wood and thanks to a specially engineered van that has been provided for her by the Cheshire West and Cheshire County Council. Pam was granted access to the wheelchair-friendly van earlier this year and has since been enjoying her new found mobility by going out with her caregiver on a whole host of varied day trips. Pam’s caregiver Johnny Wood was selected for her by Home Instead Senior Care in Chester, as they have many things in common. Both enjoy discussing current affairs and gardening and Johnny and Pam get on like a house on fire. Pam receives visits from Home Instead in Chester 7 days a week for many hours at a time, and during this time, the pair have embarked on many adventures together. Some of Pam’s favourite outings include: day trips to Llandudno, a visit to Southport and her firm favourite: browsing in Gordale Garden Centre. 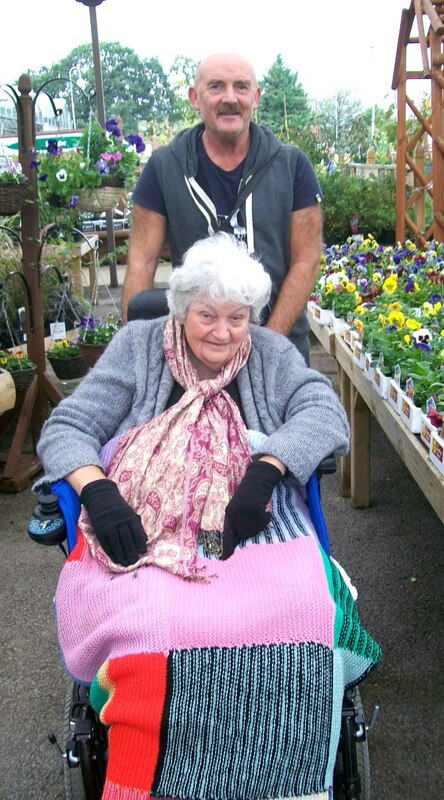 Although Pam can not easily manage her gardening now, Johnny loves to help her with her arrangements and once the pair have finished browsing, they often enjoying whiling away a few hours over a cup of tea and a chat. For more information on services at Home Instead, Chester or to join the team please call 01244 851 744 or visit www.homeinstead.co.uk.